Based in part on scripts by ickypoo (for volume slider) and MountainDragon (for autohide). It can be set to Docked, which would allow it to be positioned anywhere on desktop, or to AutoHide, which will auto-dock it to left or right edge of screen and will hide it when not used. Does it have all the functionality of the sound icon that sits in the system tray (double clicking brings up the advanced options), or it it just a plain old volume controller? No, it's just a plain ol' controller, though that's a good idea I might add it. Originally I wanted to also include slider for WAV/MP3 volume as well but couldn't find a VBScript call for that. If anyone knows how to do that I'd really like to implement that. this widget screws up winamp playing. if you play a song and like load stuff, play games etc. it uses alot of memory and playback is wack. 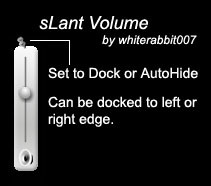 canyou shar eit with me ..i am going crazy truing to make a volume slider in my player!! !